Hasan Bajramovic is a specialist in character modeling, sculpting and texturing for games and film, who is curently working for Blur studios in Bosnia and Herzegovina. The 'Atlas reactor "Lockwood" and "battlemonk" ' project which he completed for Blur is an exceptional 3D work with creative details in each curve. Character modelling, shading and texturing has its own uniqueness and creative concept in Lockwood. The personality of Lockwood is captured in most exquisite way. Every 3D model is lively and attractive which makes the game interesting. Hasan used 3d max, v-ray, mari and zbrush to create his 3D models. The texturing of Battlemonk is wonderfully carried out with excellent shading. 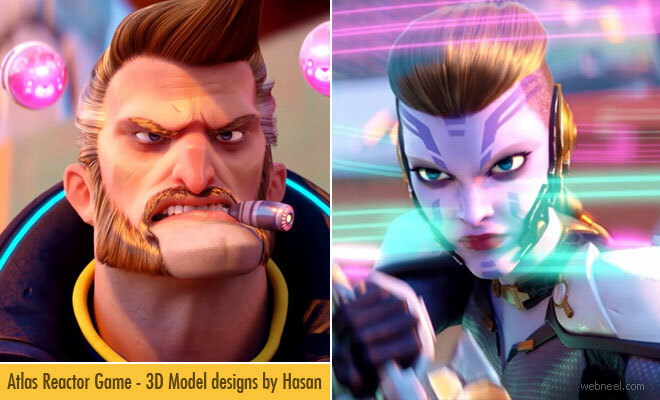 Atlas Reactor Game - 3D Model designs by Hasan Bajramovic Neel Hasan Bajramovic is a specialist in character modeling, sculpting and texturing for games and film, who is curently working for Blur studios in Bosnia and Herzegovina. The 'Atlas reactor "